Are You Looking For Powerful Portable AC For A Medium to Large Sized Room? Rated at 10,000 BTUs, the Hisense CAP-10CR1SEJS can effectively cool rooms of up to 300 square feet. It’s also easy to install using the included window kit and maintenance is a breeze. It comes with three climate control modes: dehumidifier, cooling, and fan. The intelligent remote control makes it easy to operate from the comfort of your couch or bed. It can even control the temperature settings automatically using a built-in sensor. Three comfort modes –cool, dehumidifying and fan-only. High cooling and dehumidifying performance. You can control the direction of cool airflow. 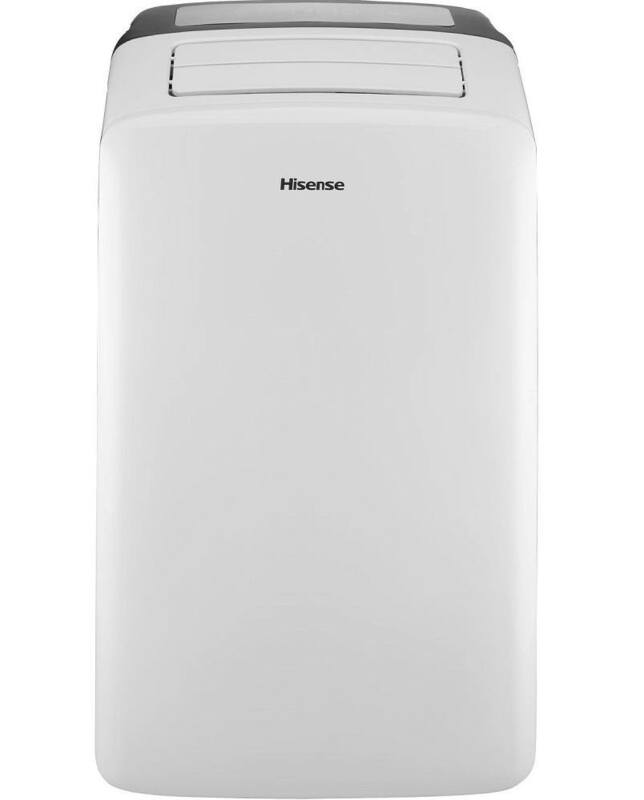 With a 10,000 BTU capacity, the Hisense CAP-10CR1SEJS portable AC is ideal for rooms of up to 300 square feet. You can use it in the living room, bedroom, kitchen, home office or any other room that doesn’t exceed the recommended size. If you have an open-concept kitchen and living area, take the entire area into account when deciding whether this AC is ideal for your needs. If it’s larger than 300 sq. ft., the AC will struggle to keep the room cool and comfortable. If you use it in a smaller room, select a lower cooling and fan speed to save energy and prevent over-cooling. For much smaller rooms, however (less than 150 sq. ft.), you are better off buying a smaller portable AC. See our full guide for other portable AC units ideal for extra-large or extra-small rooms. There are three different modes to choose from using the remote control or the control panel on the AC. Cool –this Hisense portable AC just cools; it does not heat. You just need to select your target temperature on the remote or control panel. 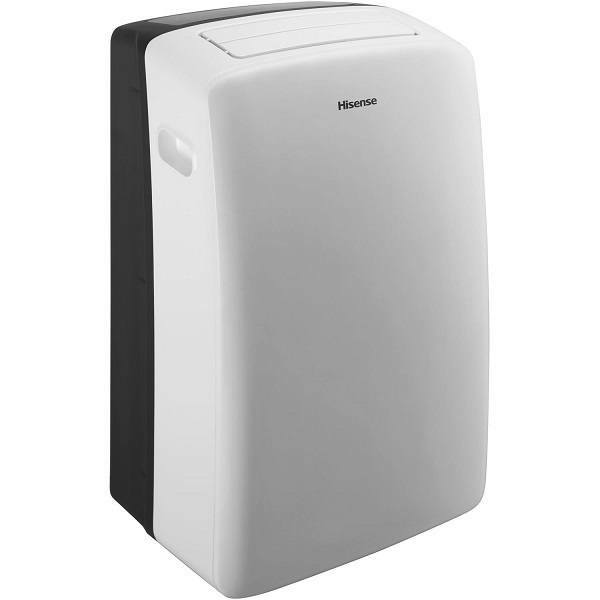 Dehumidifier –there is a built-in dehumidifier that takes out excess moisture from the air. This prevents indoor air from feeling hot and clammy. It can remove up to 2.45 pints or around 1 liter of moisture from the air every hour. Incidentally, the dehumidifying setting cools the room much quicker than the ‘Cool’ setting. You can use it on a hot day when you need fast cooling then switch to the cool mode to maintain the temperature. Fan – the fan-only mode is ideal when you just need a bit of cooling. You can change the fan speed to increase or decrease the amount of airflow. There is also a Smart Mode. In this mode, you don’t need to set anything. The unit uses sensors to select the best temperature and humidity levels automatically. 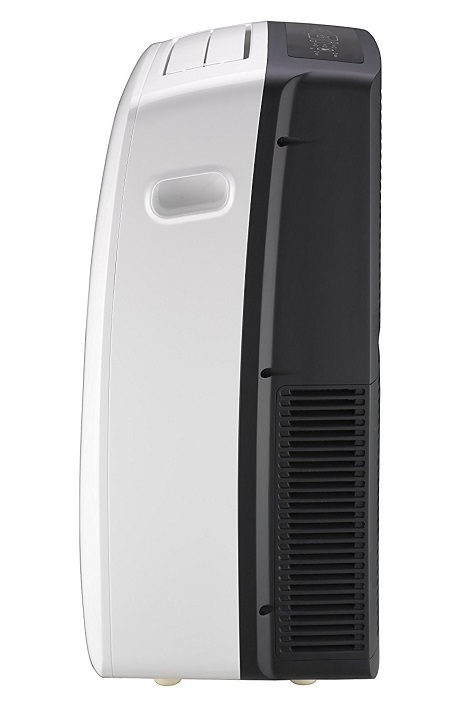 Many portable air conditioners come with remote control. 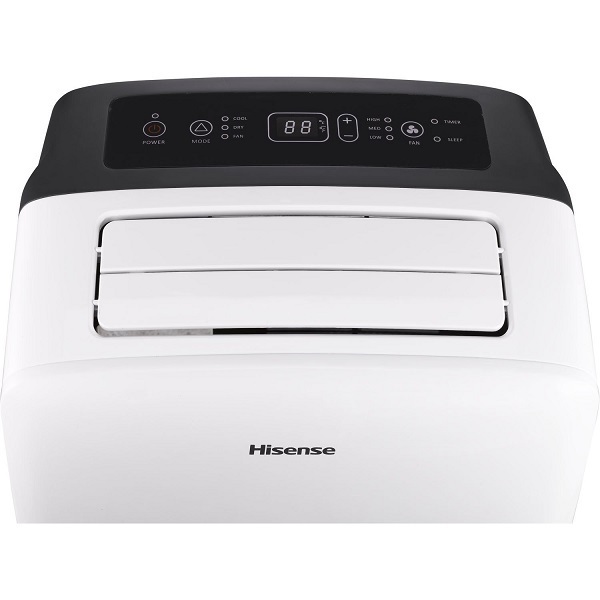 But this Hisense Portable AC unit has a slightly more advanced one. Instead of the usual plastic box with buttons, this one also has a smart sensor inside. Hisense calls it an I-Feel temperature sensing remote control. It detects the room temperature and automatically adjusts the AC’s cooling power. There is an LED display and control panel along the top of the unit. Here you’ll find the main power on/off button, the temperature + and – buttons and a fan button. There are also three speed settings – high, medium and low – for the fan and cooling power and a 24hr timer. The installation part is pretty easy. The unit comes with a window kit that works with windows from 18 to 50 inches wide. Make sure you have vented it properly outside to prevent the hot exhaust air from flowing back into the room. If it’s not possible to vent it outside a window, you can also use a sliding door. But you’ll need to buy your own sliding door venting kit. This AC is not light. It weighs 59 pounds. But that’s not an issue unless you want to take it upstairs or downstairs. For transfers from room to room, it’s easy to wheel it using the four caster wheels at the bottom. You can quickly set it up in your home office during the day, wheel it to the living room in the evening and use it to cool your bedroom at night. The biggest issue many customers have with this AC is the draining. This is not an auto-draining unit where collected moisture is vented outside. Instead, you'll need to connect a drain hose (not included) and direct it towards the nearest drain - or manually drain the unit's drip pan periodically. The latter requires lifting the entire unit over a bucket, which is tiring - especially on hot summer days when humidity levels are high and the AC needs to be drained more regularly. Note that if you want to drain the water using a hose, you'll have to place the unit on a raised platform because the plug is set a bit too low to drain on the floor. You also can’t physically connect a hose when the unit is sitting directly on the floor, so your choice is set. The best thing about this portable AC is how easy it is to live with. You don’t even have to touch a thing. Just set it to Smart Mode and let the unit do the work. When you need to get involved, manual controls and settings are easy to use. The fan-only setting also works great, and the dehumidifier helps ​keep your room dry on wet and soggy days. With three speed settings, you can customize the cooling power and fan airflow exactly the way you want.